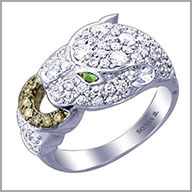 14K White Gold Tsavorite & Diamond Panther Ring. Make your fashions roar with grand refinement. This panther design ring is crafted in polished 14K white gold. It is encrusted with 76 full round cut white diamonds in prong settings; it also holds a loop encrusted with seven full round cut brown diamonds in pave settings. The eyes glitter wildly with the addition of two round cut 1.20mm tsavorite stones in pave settings. The total diamond weight is approximately 1.10ct and the total tsavorite weight is 0.02ct (both approximate). The diamond color is G-H with a clarity of SI. The setting size is 3/8" x 3/4" with a height of 3/16". Panther Ring 22-0333 - Outstanding! 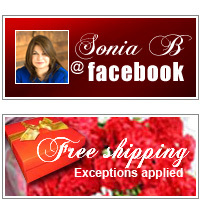 I had admired Sonia's panther rings for some time. When I saw this one, I was impressed with the low profile, the diamond weight, and the touch of champagne diamonds in the design. This ring did not disappoint. The diamond quality is outstanding, and the ring is very comfortable to wear. The tsavorite eyes just glow. The panther's features are very detailed. The size of the ring is very good for everyday wear. This is definitely my new favorite ring.